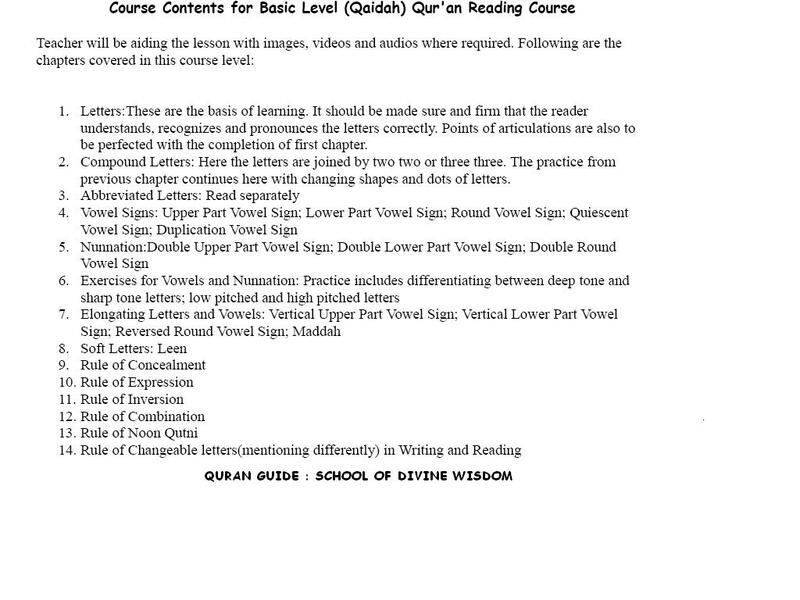 This course is also familiar in general as Qaidah/Qaida course. It is the first step towards learning to read the Quran. It provides the basic knowledge and understanding necessary to properly read Quran. In this course student will learn to identify and pronounce Arabic alphabets, basic rules, different symbols etc. Basic level or Qaidah/Qaida course helps in stepping towards understanding and gaining proper knowledge of reciting the Quran. This course facilitates in recognition of the alphabets when in full and half shapes, and proper articulation and appropriate pronunciation of letters and vowels. In addition to the articulations, basic recitation rules and identification of various symbols and representations is also instructed in this course. All the rules taught in this and following courses are known as the tajweed rules. At the completion of this course the reader is ready to correctly pronounce and join Quranic words and recite the verses but with pauses. P.S. : Lesson notes, plans and details will be provided to the enrolled students from time to time appropriately insha Allah.